I love eggs for dinner. Sometimes my favorite brunch meals are my favorite dinners. Especially if they involved eggs baked on top of a pizza or poached in a miso noodle soup or veggie stew. 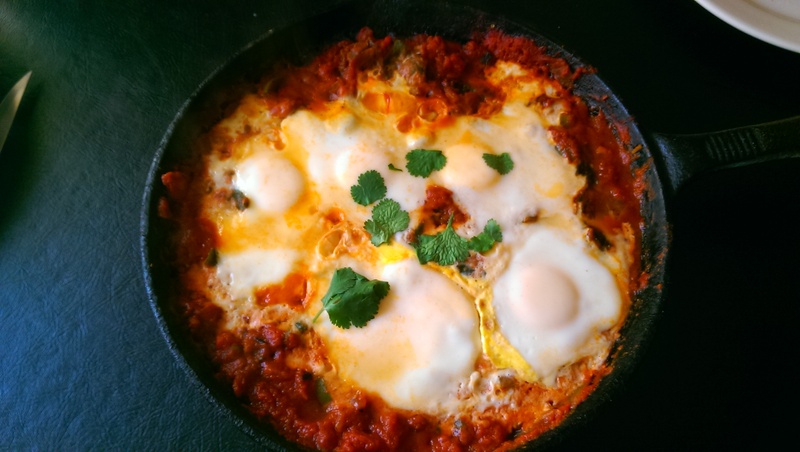 Shakshuka is a dish of eggs poached on a tomato sauce spiced with cumin, paprika and cayenne. It is believed to originate in North Africa, Tunisia specifically, and in Israel it is eaten for breakfast along side pita or challah. I have made and eaten many versions of this dish, including one of my favorites that incorporates chickpeas and feta cheese. I’ve seen it served with rice or quinoa. The possibilities are endless for the stew. The key to the dish is the spice and to nestle the eggs in the sauce and then finish the dish in the oven to poach the eggs. I wanted this to be a filling vegetarian yet Whole30 compliant dish, so I incorporated more vegetables and left out the legumes and dairy I usually add. The high acid content of a tomato naturally slows down the cooking process of other ingredients so I make sure that the veg are somewhat cooked before adding tomato and allowing the sauce to simmer and thicken. This is normally a very spicy dish but I tempered the spice from hot to medium for my daughter. I really missed the saltiness that feta offers, so I rounded out the flavor and texture by topping the finished bake with shiitake bacon. 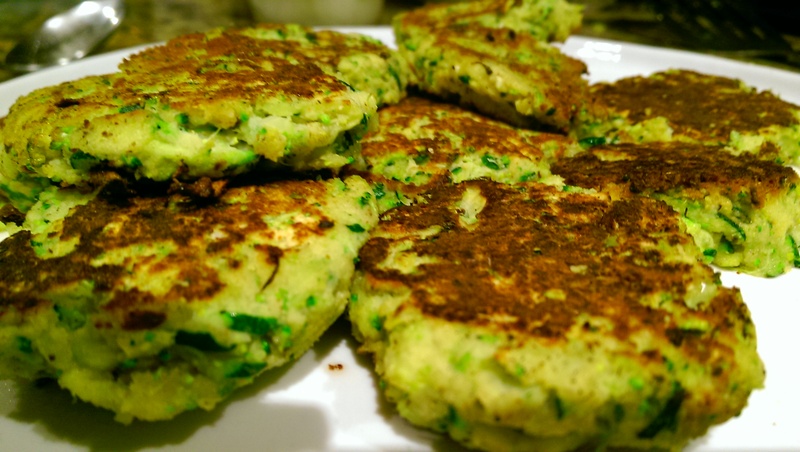 I served it with zucchini broccoli patties made with coconut flour. It was a good substitute for the bread I with which I would normally lap up the stew and filled my body with veg, instead of wheat or grain. I made this dish for dinner, but it was so good we made it again for brunch a few days later. Give it a try. Eggs are great any time of the day. Preheat oven to 425. 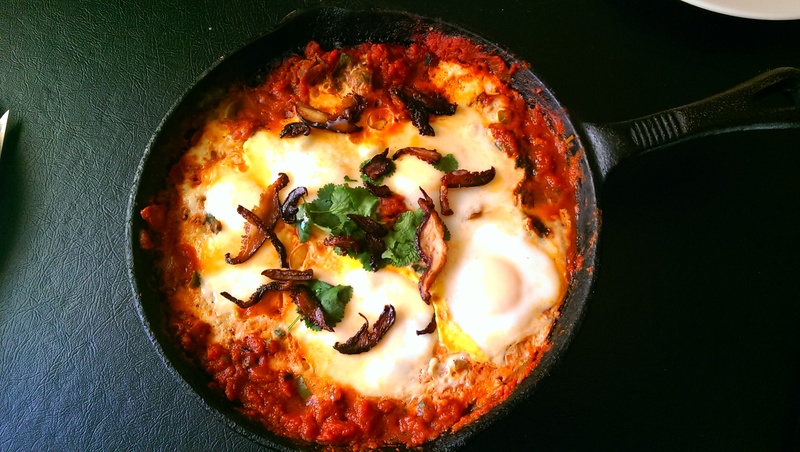 Heat coconut oil in a large ovenproof skillet or shallow dutch oven over medium-high heat. Add cumin and paprika and fry until fragrant (30 sec- 1 min). Add the onion and stir occasionally until soft and translucent (about 5 min). Add the mushrooms, and cook letting the juices come out, stirring occasionally. Add the garlic and jalapenos and stir for 1-2 min and then add in the chard and carrots. Cover pan and allow to wilt, about 3-5 minutes. Add fresh tomatoes and cook for another 5 minutes before adding canned tomatoes and vegetable stock. Bring to a boil and reduce heat to medium-low. Simmer stirring occasionally for about 20-25 minutes allowing the sauce to thicken. Season to taste with salt and pepper. Create small indentations in the stew and crack open an egg, one at a time and allow it to rest in the indentation. Remove from stove top and place in the oven for 7-10 minutes until the egg whites are set but the yolk is still runny. Garnish with cilantro and shiitake bacon (recipe here). Note the stew can be stored in the fridge and can eaten as individual servings over the week. Create individual servings by spooning out a small amount of stew into a ramekin or oven safe dish and place an egg on top when ready to bake. Make sure the shredded zucchini and broccoli are dry as possible – sprinkle with 1/2 tsp salt, toss and place in a colander, lined with a towel. Place another towel on top of the veg for 10-20 minutes. After time has passed, press down on the towels by hand or with a heavy object to press as much liquid out as possible. Beat eggs in a separate bowl, add remaining spices and chives and mix. Add in shredded veg and mix thoroughly. Mix in coconut flour using hands until completely coated. Form into small patties. Patties can be stored in the fridge at this point. Heat a coconut oil or ghee in a skillet on a medium flame. Cook patties on each side for 3-5 min, or until lightly browned. To keep them crisp, cool on a wire rack. These can be eaten on their own with an avocado sauce (avocado blended with lemon and salt) or an aioli.